I’ve been wanting to tell you all some news I have had for a while now. I’m not normally very good at waiting so I’m impressed I have managed to not spill the beans before now. As with any nice news it’s special to be able to share it with loved ones, family and friends. As I class you all as friends (I feel like I know many of you really well and love that), you get to be in the know. The wife is expecting our first baby cub in October and we have been informed the cub is to be a little girl!!!! (they think!). We are over the moon. Words couldn’t really cover it and my wife looks so happy (even when she isn’t feeling well or needs to nap). But I do find myself worrying every time she calls in case something is wrong! I guess I will be like that the whole of these 40 weeks (and for the rest of my life)! With expecting the cub in October we have a lot to sort out and even though it took so long to plan for her (so it’s not like we didn’t know it was going to happen) now we know she is on her way we need to get going! I have of course started a Pinterest board for the nursery and a scrapbook as I still love old school! I’ve been informed I can’t go fox mad! Our living room is a little bit full of fox stuff. I went a little mad on the run up to our wedding! I’m keen to make curtains with some vintage linen I own, some of which is from our wedding. The wife took one look at it and said “You do know I’m having a baby not a 80 year old”! She will come around (she always does)…. We have been very lucky to have already been given some lovely things from family and among them was a lovely Moses basket and vintage style blankets (thinking of adding ribbon to them). I of course should be reading all the baby books but I haven’t! I found a really nice magazine called Baby London which I think is more me. I’ve got a book about being the other mother which opens up a load of questions / thoughts / worries, like what will I be called? I wanted to be called Dad but the wife is not having any of it! Now all this talk of a baby cub I don’t want you all worrying this blog is going to go all baby on you but it may have the added fun of some mini vintage outfits now and then!!! Thanks so much, it’s nice to be able to share the nice news. I can’t wait until those feet get their first pair of shoes! So nice to hear from you and glad you like the Fox shoes. The wife and I had to get them! We saw them at a gift fair when we went to Harrogate. The lady who makes them has a Facebook page called ‘Fatfingers’. No idea how you make them but love them. Thanks for the scarf link – not sure how much Fox bits I will get away with. Congratulations to you both – what wonderful news! I just saw this!! How wonderful! It will be such fun to follow this storyline . 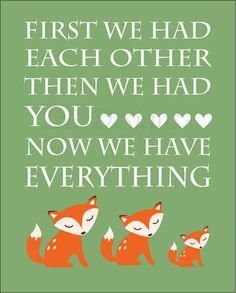 . . and to see how much of the fox motif you can sneak into baby’s world! I will keep you updated on the Fox stuff I get away with! Looking to make a lot of bits myself which I know you would approve of. I have never seen anything like that pea in the pod outfit! It doesn’t look that easy to make but would 100% win best fancy dress outfit at any party.